Just say YEAH, YAY or YES!! HAPPY NEW YEAR—don’t be a ‘whiner’—CELEBRATE by saying yes to your life. I truly loved hearing the exuberant cheers, pans banging, fireworks and cannons booming, it seemed like a joyous celebration of LIFE! I live in a great neighborhood where families were up & screaming & cheering together—it was great!! BUT as I looked out over my neighborhood from my back deck, a neighbor below started yelling, “Shut up, We are trying to have some peace and quiet over here!” My husband and I looked at each other wide-eyed & smiled, “Seriously. This guy is telling people to shut up on New Years! !” We couldn’t believe it & felt kind of sorry for him and his poor kids, who obviously were not taking part in any part of the celebrations. My husband and I talked about it this morning in bed & decided we would rather celebrate life and find the JOY in it than be a true ‘whiner’ & not the celebration type (smile. smile). Life should be celebrated!! and that doesn’t mean just one day a year. This is a new year to truly begin again & see things you appreciate, evaluate what is truly important, look for the things that inspire and take your breath away. Life is in the details…it is in the moments, it is in trying things, making memories, and truly seeing what makes your life great!! My husband and daughter were outside the other night playing in the snow, spontaneously doing snow angels in the dark. I didn’t have any warm clothes on & just watched them from the front door. I enjoyed the memory they were making together, but I was determined to be part of it, so I ran out in the snow in my slippers and a tank top & did a snow angel of my own. Oh yeah!! Oh YES!! 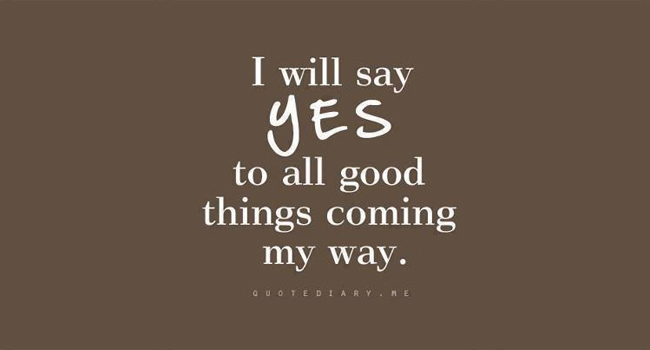 What are you going to say YES to this year? This makes me think of an incredible video of people doing amazing things—HOW? because they tried. They practiced, they took the leap and if they fell down, they got back up and began again. Sure, this video is full of extreme athletes, wild rides, but it is also full of the spirit of trying, going beyond and saying YES!! Hope you enjoy. I also found this great video by Snow Patrol while I was looking for images of YES—it is a beautiful song that you could imagine saying YES to life, going forward in a relationship, believing and having faith is someone bigger—and saying YES. Plus, it just has a good beat and creative visuals. 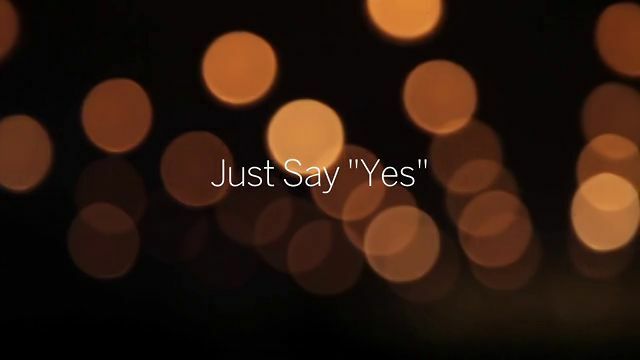 Song: JUST say YES Enjoy. CELEBRATE LIFE…SAY YES. Have a beautiful New Year. Next DREAM. Follow your heart wherever it may go. Keep the good stuff coming Heather!! This year, I’m going to say yes to breathing. I’m going to let go of stress and unhappiness, stop making self-imposed expectations that I know I can’t live up to, and just say yes to being happy and breathing freely. Happy New Year, may it be full of reasons to celebrate!